With so much attention focused on the billion-dollar Bay Area tech company valuations and San Francisco rents and home prices that have escalated to all-time highs, we decided to work with powerhouse San Francisco Bay Area real estate brokerage Pacific Union to build a profile of the most affluent home buyers—those who are paying all cash. Pacific Union analyzed 323 cash transactions their agents were involved in from February to June this year, with some very surprising findings. 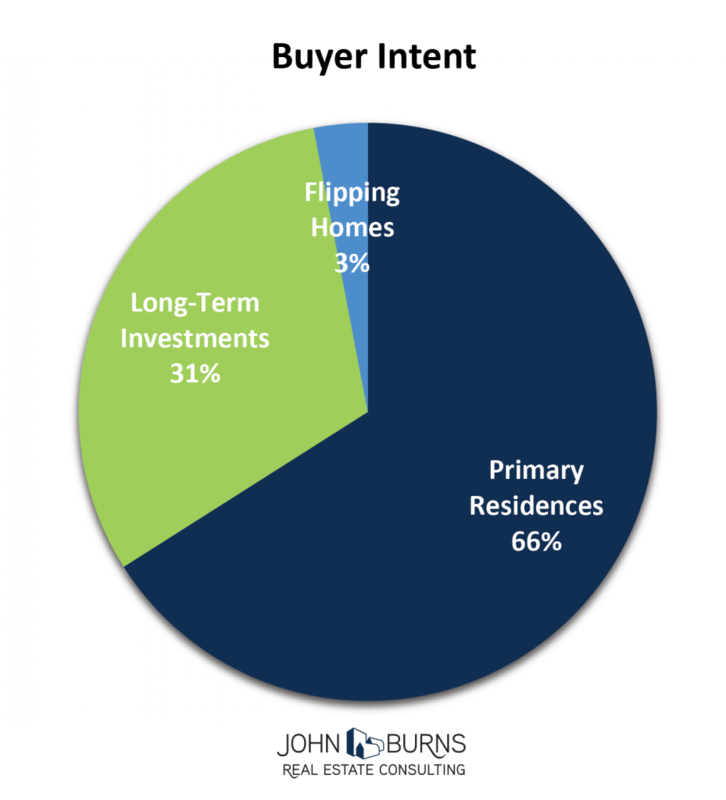 66% of the cash buyers purchased a primary residence, while 31% purchased long-term investments and 3% purchased homes to flip. 12% tech buyers. Only 40 of the 323 buyers came from the tech industry, and 24 of those 40 purchased in the City of San Francisco (28% of the all-cash activity in the City). 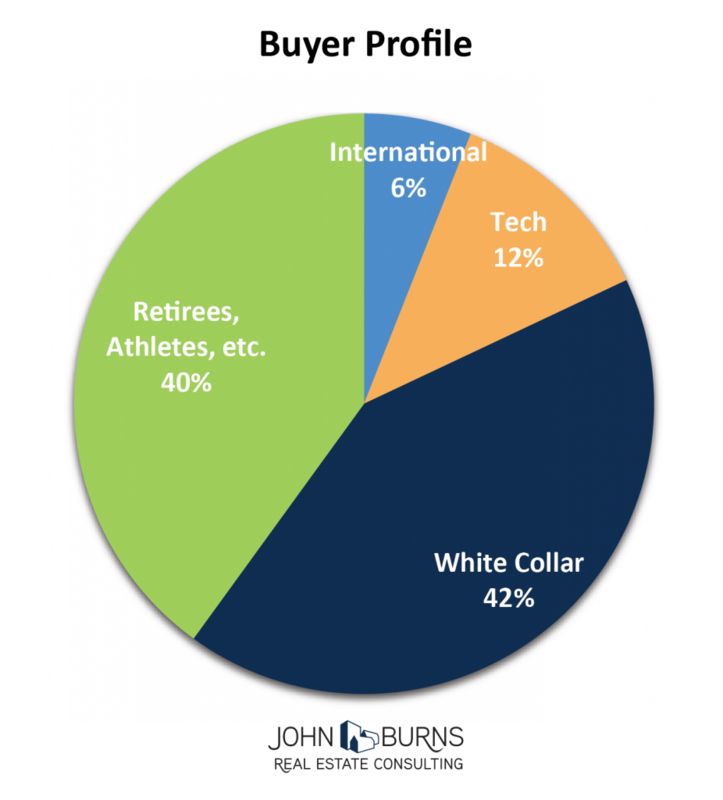 42% white collar professionals. Investment bankers, consultants, and other white collar professionals purchased 136 homes. 40% other buyers. Retirees, athletes, artists, and students with family money bought 129 of the homes. Retirees were the largest group. This is consistent with what we are seeing in other big cities such as Chicago. 3% to flippers. Flippers purchased 10 of the 323 homes. 7% investors to rent. 24 of the 323 transactions were completed by investors who intended to rent it out. This group included no international buyers and was all affluent domestic individuals. Following the dot-com crash of 2000, San Francisco and San Jose apartment rents fell 34% and 41%, respectively, and we think another decline this time around is inevitable. 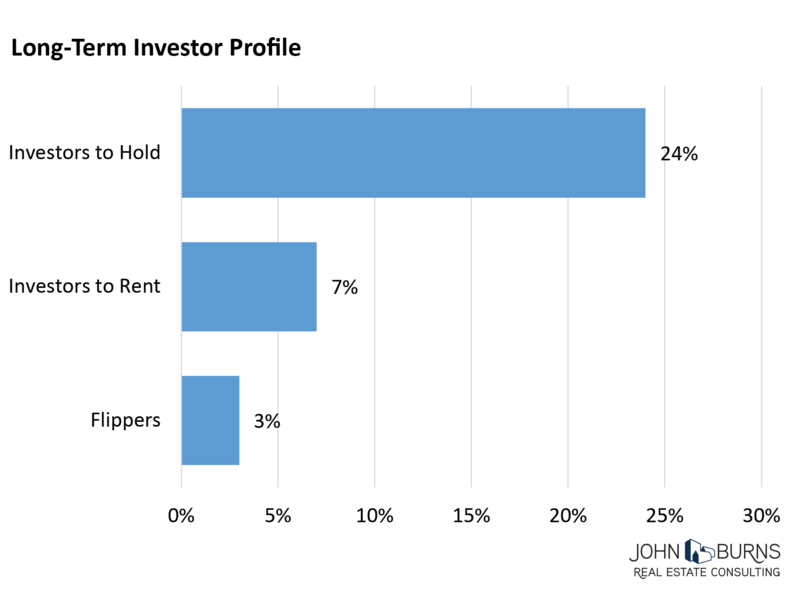 One of the best leading indicators we’ve come across in trying to identify inflection points in Bay Area apartment rents is venture capital (VC) funding patterns. As seen in the chart below, the average VC deal size for Silicon Valley / Bay Area-based companies rose from $4.9 million in 1997 to a peak of roughly $17 million in 2000, equating to a 243% increase. In addition, apartment rents in San Francisco and San Jose increased a staggering 52% and 60%, respectively. Over the next three years, VC funding to local companies plummeted in lockstep with apartment rents. 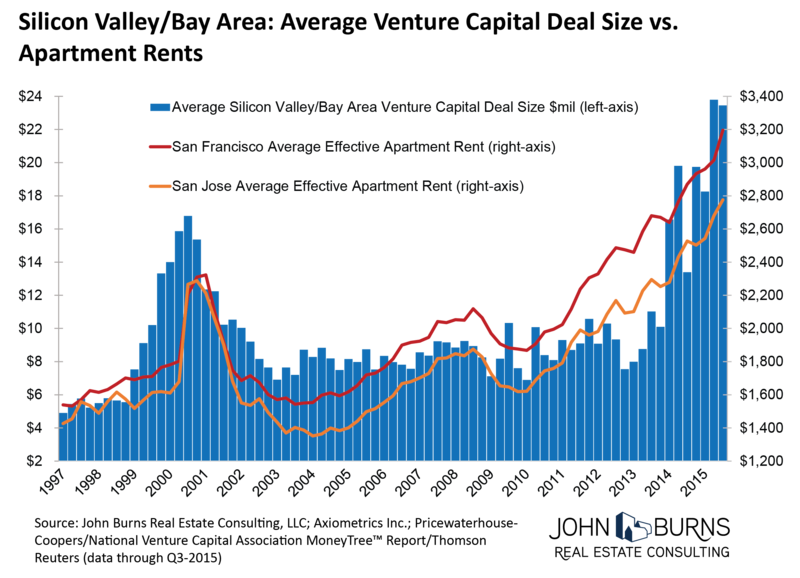 Fast forwarding to the current tech sector upswing, the relationship between VC funding and apartment rents is once again presenting itself clear as day. After bottoming in 2010 at $6.9 million, the average VC deal size for Silicon Valley / Bay Area-based companies has since jumped to $23.5 million, equating to a 240% increase (almost on par with the 243% run-up of the last tech upswing in 1997–2000). During this time span apartment rents in both San Francisco and San Jose have shot up a staggering 71%. At $3,200 and $2,800, rents in San Francisco and San Jose have respectively eclipsed prior dot-com bubble peaks of roughly $2,300 by a double-digit margin. In conclusion, the San Francisco Bay Area is on our watch list for a correction. While we strongly believe that San Francisco has become a permanently more expensive place to live and should be one of the most expensive places to live in the world, the recent increases in home prices and rents have also been fueled by speculation. Americans who do not work in the tech industry are purchasing approximately 82% of the all-cash homes in the San Francisco Bay Area. Approximately 34% of the all-cash buyers are purchasing as an investment. 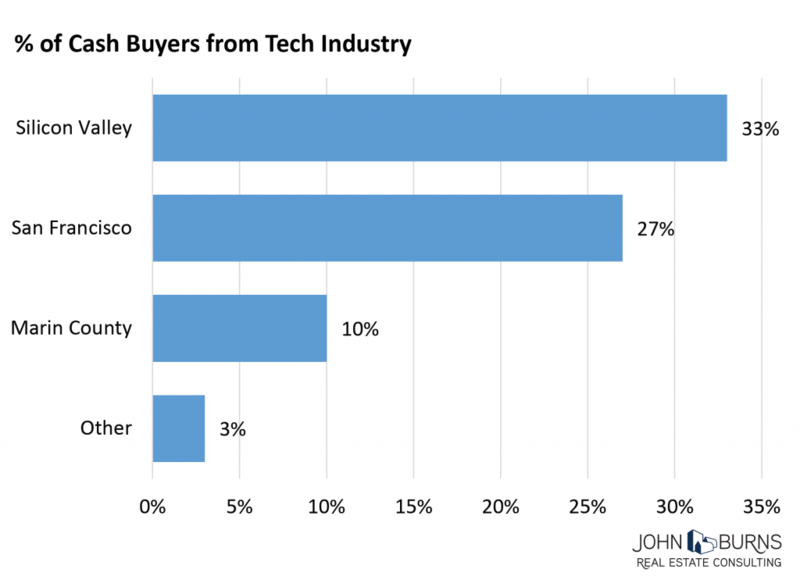 The tech industry represents as much as 33% of the all-cash buyers in Silicon Valley and 27% in San Francisco, but much less elsewhere. International buyers are only 6% of the activity. Affluent older buyers, often for investment reasons, have identified San Francisco as a place they want to own or live and have driven up prices dramatically. Dean Wehrli and I will present these findings and others with Pacific Union CEO Mark McLaughlin this Wednesday, November 18 at Pacific Union’s Annual Housing Outlook. We look forward to discussing the complicated San Francisco Bay Area market with those who will be in attendance. Pacific Union has approximately 10% market share in the Bay Area, with much larger market share in certain areas (like the Marina area of San Francisco) and lower market share in other areas (such as the Mission District), so the conclusions might be different if a 100% sample size were taken.